Our MULTIGRIP® combines backhoe and grapple in a unique attachment tool. Taking a closer look, one quickly realizes that not only does it resemble a human hand, but it also functions just like one. A design based on practical use and derived from mother nature. Unlike with a grapple, the material doesn’t have to be held between the teeth all the time. As is the case with a hand, it is positioned on the palm for the entire duration of the transport, i.e. the bucket. It is therefore nearly impossible to lose the transported material. This also means that damages caused by falling rocks etc. are a thing of the past. Our MULTIGRIP® is perfectly suited for all grabbing and digging operations. 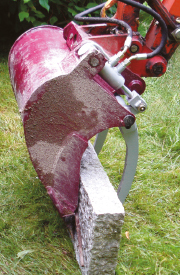 Simply ideal for moving stones, back-filling of soil and grabbing wood and brushwood. In doing so, it mostly proves to be faster than a grapple. The MULTIGRIP® allows you to sort all types of materials. Even soil or grass can be grabbed, which results in a total performance boost of 30%. 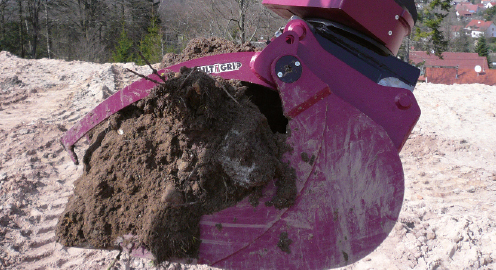 Due to its unique design, the MULTIGRIP® bucket features an optimal penetration behaviour and proves to be ideally suited for holding bulky material. 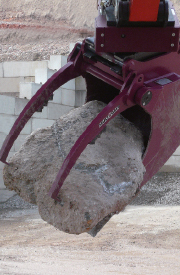 Entirely made of HARDOX, the MULTIGRIP® bucket is even perfectly suited for moving rocks and offers excellent durability even with these tasks. What is more, our MULTIGRIP® is significantly lighter in weight than a grapple, an advantage with smaller machines for which a grapple is too heavy. That’s why the performance boost is undoubtedly at its most significant with the smallest of excavators. Many people are well-acquainted with the American principle of the so-called "excavator thumb”. The thumb actually needs to work against the bucket. Solution: The "finger” must be attached to the bucket. In this way, the load in the bucket is in a fixed position and may be rotated endlessly (360°) using a ROTOTOP®. 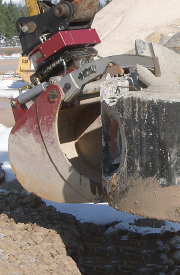 In addition, the MULTIGRIP® bucket may be dismounted and exchanged among the various excavators. 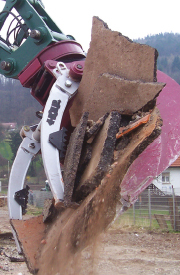 The MULTIGRIP® provides you with a wide range of grabbing options for excavators starting at 600 kg. The thumb principle brings about some safety advantages, since the load is transported in the bucket after lift-off. Therefore it doesn't have to be held between the teeth as with a grapple. We therefore solve the problem, especially for smaller excavators, that, when having to lift a load of dirt over a high sill, most of the load falls out of the bucket. In doing so, we achieve an enormous performance boost - and that's just because the bucket is still full. Our MULTIGRIP® shows its versatility also with the fingers solidly fitted. The MULTIGRIP® bucket features a shaft with quick-coupler adapters which may be fitted with a number of different tools - even custom-made ones. By using these tools one is able to do work which otherwise made other equipment, such as a grapple, necessary. Trouble-free mounting and dismounting of the various tools on the shaft enables you to perform quick changes at any place - even if there is a steady need for other grabbing tools, you won’t suffer any time losses any more.